From what we’ve heard in the past week from the Trump administration about respecting a former four-star general, you’d think it would show greater deference for other members of the military. A political dispute that began last week highlighted this sharp contrast between words and actions. After making a call to offer his condolences to the widow of a soldier killed in action in Niger, President Trump faced criticism from a Democratic congresswoman who was present during the call for what she characterized as a lack of empathy. “Basically, he said, ‘Well, I guess he knew what he signed up for, but I guess it still hurt,” Rep. Frederica Wilson, D-Fla., told Don Lemon of CNN last Tuesday. While Trump has publicly disputed Wilson’s version of the events on Twitter, it’s not hard to believe that the notoriously insensitive president would say what he’s been accused of saying, even to an American war widow. What’s more concerning for the country as a whole is the administration’s decision to wheel out his chief of staff, former Gen. John Kelly, as a military prop to hide behind. 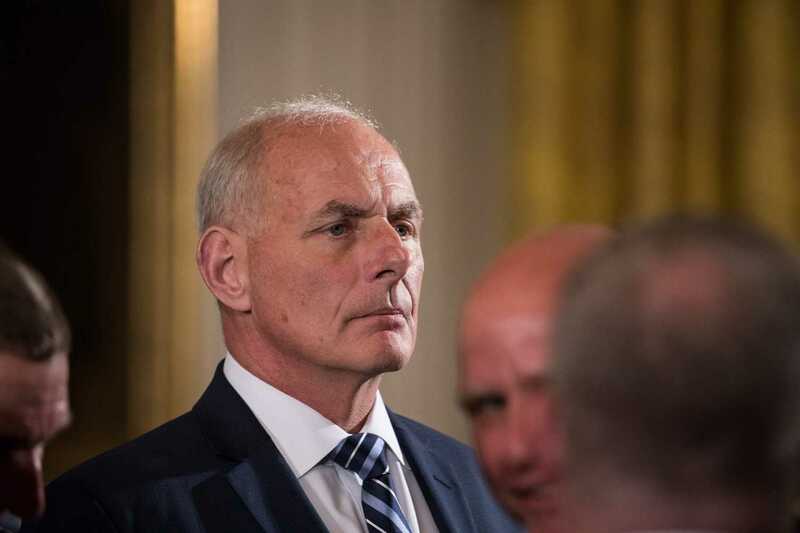 In a speech at the White House Thursday, Kelly condemned Wilson for “politicizing” the soldier’s death — making claims that were later revealed to be blatant lies. When Wilson hit back at Kelly, White House press secretary Sarah Huckabee Sanders stepped in, calling the congresswoman’s disagreement with the Trump administration unpatriotic. “If you want to get into a debate with a four-star Marine general, I think that is something highly inappropriate,” Sanders said at a White House press conference Friday. Simply taking Sanders’ and Kelly’s statements out of context, they might come across as venerating the military as above politics. But in context, it’s obvious the Trump administration only cares about the military when it can use it as a political pawn. According to Kelly, divulging the contents of Trump’s call to a gold star widow was a sign Democrats no longer consider families of American war dead “sacred.” But his selective outrage allows him to serve in the administration of a man who publicly slandered a Muslim gold star family last summer and avoided the draft in Vietnam five times. It’s obvious the Trump administration’s decision to put the military front and center in its political rhetoric is a bad move for the country. Invoking the country’s armed forces only when politically convenient isn’t patriotic — it’s opportunistic.